On May 9th 2018, Nintendo will be terminating their first mobile App Miitomo. Since the app was first released, Myself and many others around the world have enjoyed logging into the App and having fun with all the different outfits, answering questions, making our rooms unique and taking pictures with the Miifoto function. It has been a unique experience that many creative people have used to make their own Youtube videos, create interesting pictures with their Miis and broadening their range. It has even helped people through some of their darkest moments by given them a means to escape the harsh realities that they face day by day. We want Miitomo to grow and flourish, it has so much potential that it is not reaching. We know that maintaining this app uses resources that could be better used in creating even more fun and interesting games, but they wouldn’t be Miitomo and we will all be lost without it. All our precious time and money that we have poured into Miitomo because we love the tiny escapism that it gives us. To lose everything that we have put in to make Miitomo unique to us is just deeply saddening. I know that to many it is just some silly app created as a means to make money and help sell Nintendo Brands, but for some of us that actually cared about Miitomo, It has allowed us to be creative with ourselves and be more expressive than we probably are in real life. 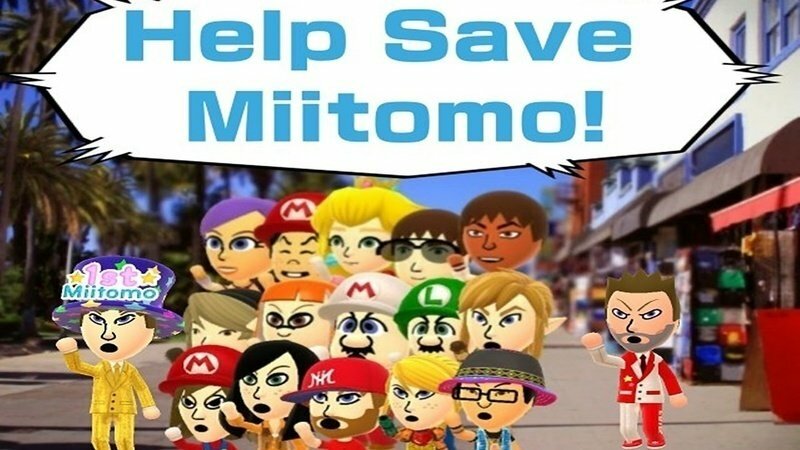 This petition will not cease the termination of Miitomo, but if we can get enough publicity, than maybe Nintendo will see just how much Miitomo means to those that really enjoy it. So come on everyone! Let’s join together and #SaveMiitomo! You can make your voice hears right now by signing our petition on Change.org here. I want to keep it too, I love Miitomo! How do I vote yes? We must save Miitomo I have not had this long about 1 month and I can’t stop playing. So please Nintendo keep Miitomo. (And if not then bring back super Mario clothing for the last week Please). Nintendo doesn’t have to spend anymore time or money on the app they can just leave it how it is. I hung on way longer than others to Miitomo, eventually I was just talking to myself though for the My Nintendo coins. It’s well and truly dead it seems, and like Miiverse before it, I’m going to miss it. It is a shame and I think Nintendo gave up on the app long before the fans did. In the beginning, we had all these Nintendo themed outfits celebrating game releases and events and over the last hill, it has just been downhill. However, I still have a lot of fun with it, making our feature images and general messing around with the Miis. Miitomo is a great app and many loved it. If only we could save miitomo, or at least know why it will shut down, we might feel better. Mainly due to the diminishing number of users and decreasing revenue. Miitomo was never a very popular app but it still brought great joy to all that did stick with it. I know exactly what you mean, Miitomo has helped me make friends that I now talk with on a regular basis. Me too, let’s hope Nintendo will hear our pleas and instead of terminate it, find another way to sustain it. Keep Miitomo going! I love playing it and I want to keep all my Miis! I hope we can save it together! Save Mii Tomo SPREAD the word and save the date! Me with my depression please keep it. I know what you mean. Miitomo has helped so many people with their depression and has been a conduit to help express ourselves when normally we are very reserved. It’s one of ours as well. It’s where I get my Mii pngs from to make out banners and feature images. I’m not a good enough artist to do them by scratch. I agree..just after finding out about it and enjoying it with my family, I hear it is ending…I hope it stays!